We’d love your help. Let us know what’s wrong with this preview of Coming Home to Sicily by Fabrizia Lanza. To ask other readers questions about Coming Home to Sicily, please sign up. I've only tried a few recipes from this book so far, but they are phenomenal. Having lived in Sicily for two years, I loved the stories of food and culture and the flavors that came out of the recipes. I have some mixed feelings about the book - I dislike the elitist aspects of the slow food movement and this book has them in spades, but the author is very aware of it and I think that helps. A number of the recipes are also so simple as to not really be recipes, but they capture the simplicity of Sicilian cooking and the primacy of good, local ingredients eaten fresh. 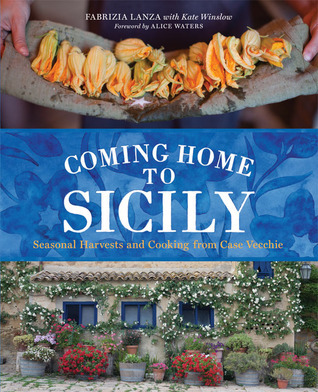 Lik Having lived in Sicily for two years, I loved the stories of food and culture and the flavors that came out of the recipes. I have some mixed feelings about the book - I dislike the elitist aspects of the slow food movement and this book has them in spades, but the author is very aware of it and I think that helps. A number of the recipes are also so simple as to not really be recipes, but they capture the simplicity of Sicilian cooking and the primacy of good, local ingredients eaten fresh. Like I said, mixed feelings. Food defines the rhythm of life in Sicily. There are beautiful photographs & interesting anecdotes to go with the recipes. But these recipes are not for the beginner. One senses there is a bit of wizardry in the kitchen at Case Vecchie. History + recipes both complicated and rustic and some with hard-to-source ingredients--right up my alley! I really enjoyed the back story. Case Vecchie is a place I would visit in a heartbeat and Fabrizia now seems like an "old friend". I will find my way to Regaleali one of these days.